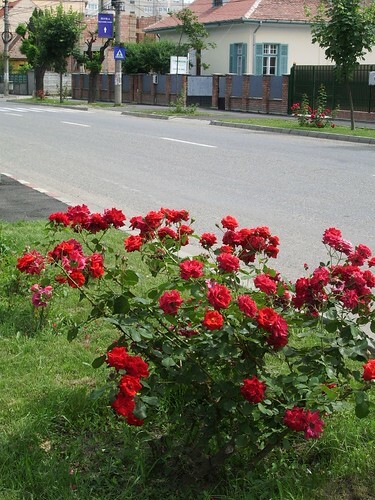 These rose bushes really cheered up this road, which leads into the city. 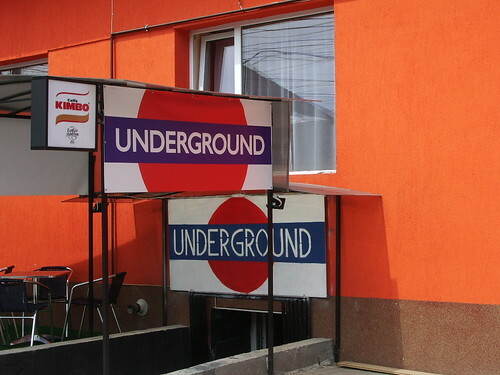 This roadside cafe-bar was obviously inspired by London – though I must admit, as a former London resident the thought of spending a pleasant half hour with a beer and a cake isn’t one I’d usually associate with the Underground! 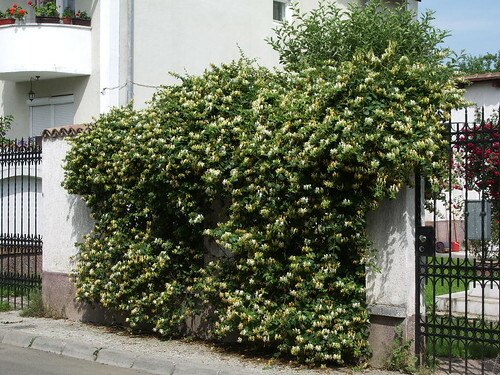 This honeysuckle had completely taken over this wall, and the smell was really overwhelming. It was absolutely gorgeous. 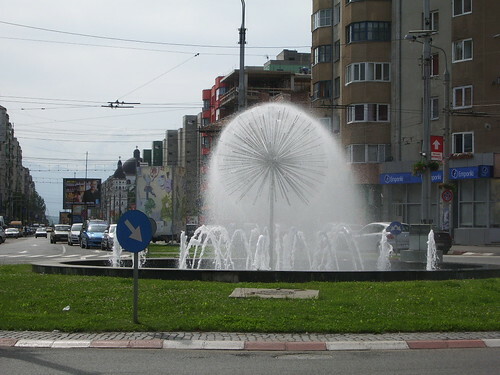 This fountain, on a roundabout on the way out of town, always reminded me of dandelions. You can see the more modern (ie socialist realist) concrete apartment blocks behind it – although central Sibiu is very pretty (as I hope this blog has amply demonstrated) plenty of people live in the socialist-era blocks as well. This is only a short walk from the city centre. I’ve forgotten the name of the roads this fountain is on – we tidied up recently and I’ve mislaid my map! Will update later if I ever find it again! A couple of views from Piata Mare. I couldn’t make up my mind which one I prefer, so I am posting both of them 🙂 The building to the right is the Town Hall, and (below) the building on the left is the Brukenthal Museum. 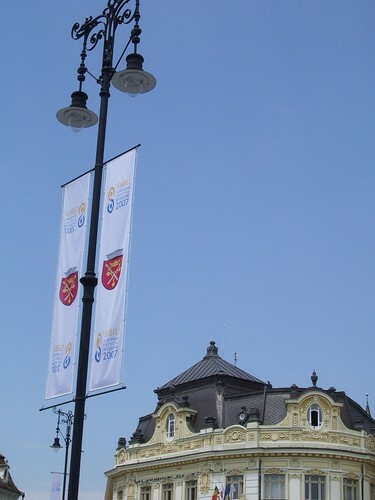 One last glimpse of the logo for the Theatre Festival before it was taken down, in time for the next festival (festivals were two a penny that year!). 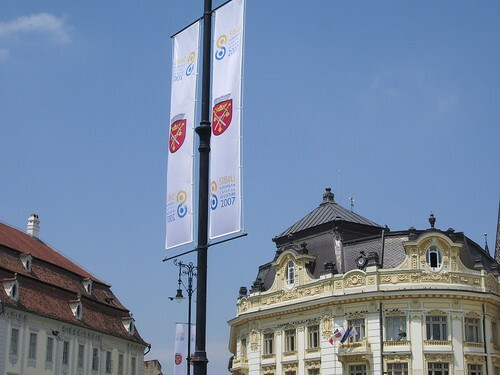 Posted in Uncategorized | Tagged: festival, logo, Sibiu | Comments Off on Next! 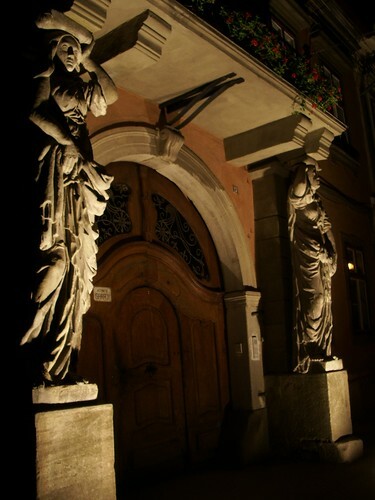 I’ve shown this doorway on Str. Mitropoliei before, but as I walked past it it was usually difficult to resist the temptation to take another picture, especially at night when the statues are lit up. 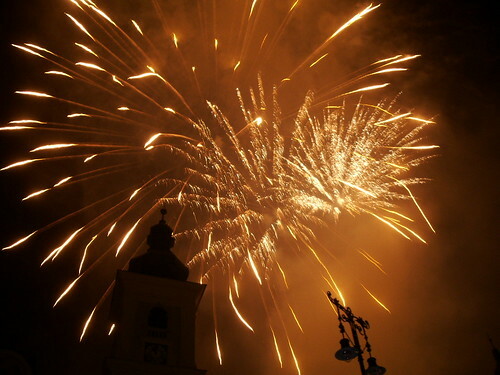 This was on my way home from the festivities in Piata Mare. 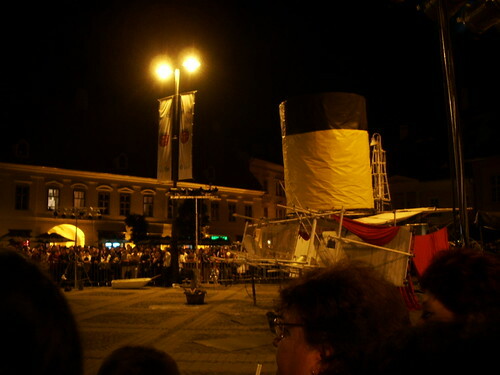 The very final event of the Theatre Festival, even after the closing fireworks, was to be a late night street theatre performance called Titanic. 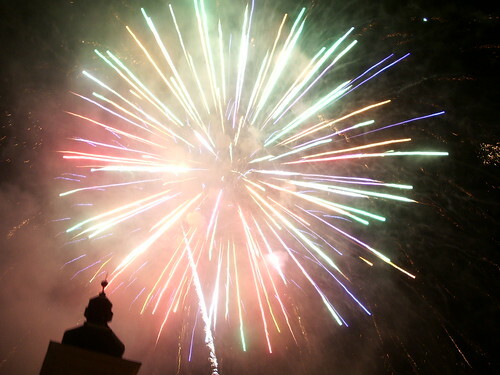 This is a bit of the set, a few minutes before it started. Unfortunately pretty much as soon as it started the crowds got so thick that it was impossible for me to see anything at all of what was going on, so I gave up pretty soon afterwards.